In Georgian houses, only the grandest had a bathroom and then the bath was a plunge pool. 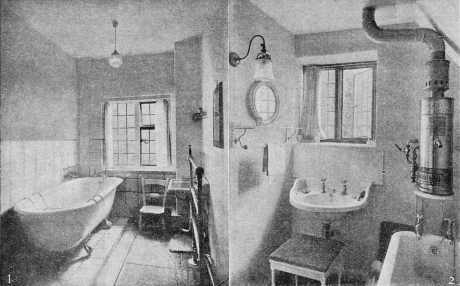 The bathroom, in its modern meaning began to be introduced into houses of the upper classes from the 1820s. It was not until the 1880s that most houses for the middle-classes were built with bathrooms and full-length baths. The conversion of older houses really only happened at this time too - it was only then that hot water could be pumped up from a lower floor. After 1900 all but smallest houses were built with an upstairs bathroom and toilet or lavatory. It was not until the 1920s that plumbed-in bathrooms were more common in working-class homes. In older houses, a bathroom was converted from a bedroom or dressing room and some could be large. However, in new houses the early bathrooms were small, as people would still wash in their bedroom and therefore no basin was needed in the bathroom and the toilet was usually in a separate room. The bathroom was typically above the kitchen or scullery i.e. the source of hot water and plumbing services. The floor was usually covered with linoleum having a tile pattern of 6 inch (approx 15cm) squares. Alternatively it was carpeted with cork. The skirting and fitted furniture such as a wall cupboard was painted dark brown. A varnished paper was used on the walls and this had a tiled or mosaic design. Alternatively, there may have been a tiled dado. Edwardian bathroom tiles were usually white or blue. It was usual to have etched glass in the lower half of any external windows, and in the door. Early bathrooms had just a bath; people continued to wash in their bedrooms. By the early 20th century, wash-basins were added. This is covered in more detail in Design by Element. In the Edwardian period, gas-powered geysers appeared which provided hot water in the bathroom.